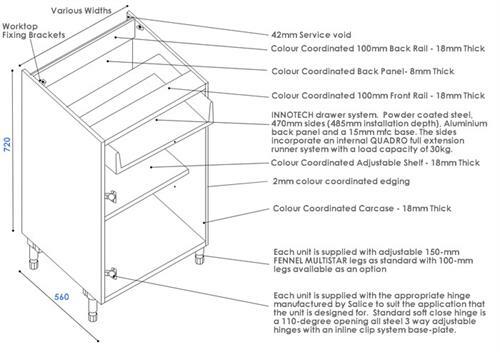 The carcases we supply are constructed using glue and dowel techniques employed by the leading kitchen manufacturers in Europe. Carcases are manufactured using Egger 18mm high density melamine faced chipboard with 8mm melamine faced chipboard backs to both wall and base units. Carcase front edges are lipped with a durable 2mm PVC edging material to match the various carcase colour selected. All other exposed edges are lipped with 0.4 edging tape. Base units are drilled to provide 3 adjustable shelf positions. Cover caps in either white, beige or brown are provided for the unused drillings. Three way adjustable concealed hanging brackets are fitted to the wall units. Each pair of brackets can carry up to 70 kilograms and conforms to DIN68840. All wall units are drilled to provide adjustable shelf positioning. 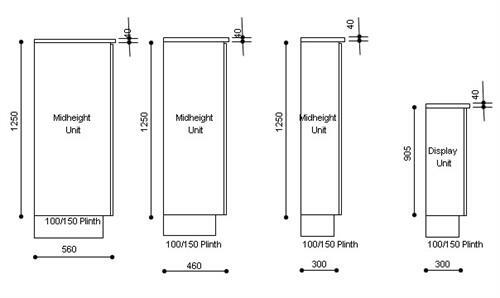 570 high units have one shelf, 720 and 900 high units have 2, cover caps in white, beige or brown are supplied for the unused drillings. 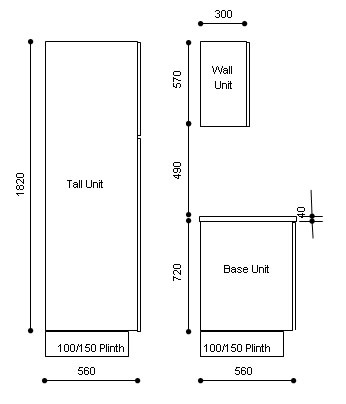 Wall units are 300mm deep excluding the door. 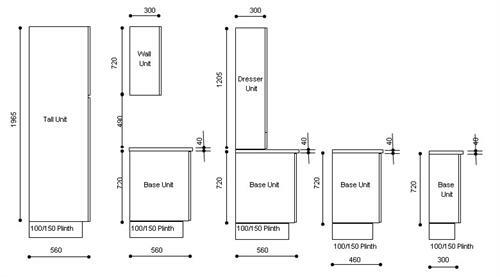 We can offer flexibility to the carcase specifications - units can be increased and reduced in depth. (limits apply). This can be requested when a meeting takes place. 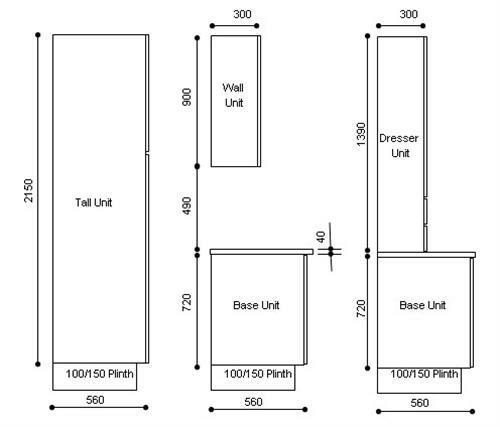 Where units are shown with drawer and pan drawer boxes they are supplied fitted in to the units. These are full extension Hettich Innotech Double skinned metal drawers. 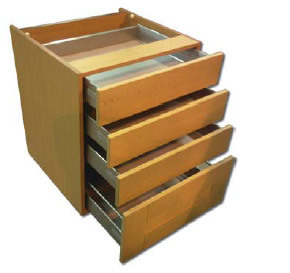 Pan drawers have a gallery rail supplied to increase the height of the drawer. We use the INNOTECH full extension drawer system as standard. Powder coated steel, 470mm sides (485mm installation depth), Aluminium back panel and a 15mm mfc base. QUADRO Silent System Soft close system can be built into the quadro runner system with a load capacity of 50kg. Soft close drawer boxes can be requested. Each unit is supplied with adjustable 150-mm FENNEL MULTISTAR legs as standard with 100-mm legs available as an option. Both of the leg options have a minus adjustment of 10 mm and a plus adjustment of 20 mm. The legs fold into the foot for transport as can be seen in the following illustration. Each unit is supplied with 2 adjustable plinth clips clipped on to the front 2 legs. The plinth clips fit over the top of the plinth and have a lip that fits over the top of the plinth. With every order 6 self-adhesive clips are sent out for the plinth returns.